It is done. Chapter 5 is here. Read it fools! Nixion was sure that they’d fail. They would never stand a chance with this crew of pathetic misfits. They had a vampire, a necromancer, an elementalist, a metal-bender-person-thingy, a person who could change the shape of her hands, and two people who had no magic besides fighting abilitieswhatsoever. Lyra was good, Nixion knew seeing as he had battled her himself. She was impressive, formidable and deadly. Overall, a rather excellent combination of skills. But Nixion didn't trust this new person Thomas, Kali and Mahogany had brought back with them. He did not know who he was and, although this rule had been broken many times in the past few days, Nixion was firm that he didn’t trust anyone he didn’t know. Even people he did know. Nixion pondered over this for an hour and found that on the inside, the only person he really trusted was Mist. He vowed never to tell anyone this. He took a dislike to this new person at once. Even ignoring the fact that he seemed to share his and Mist’s liking for nothing but black, Nixion got bad vibes coming from him. He knew that this newbie would either be extremely annoying or over-the-top with a fearless attitude and try and take over Mist’s lead on the group. Mist’s lead? Since when had Nixion agreed to that? Mist was not leading this team…or was he? His name was Stavan, Kali informed them all, and was an ex-Cleaver, fired for “inappropriate behaviour”. That didn’t exactly make him any more popular with Nixion. When Mist had asked Kali how she knew him she had said “We’re old friends.” But Nixion had heard something weird when she had said “friends”. He assumed this meant that she really didn’t like him at all, but knew that he would be helpful in battle. Now that he took a closer look, it seemed that this newbie really did dress a lot like Mist in particular. He dressed all in complete black. A black jacket stretched down to his boots which were also black. A black shirt accompanied by black pants hung loosely on his body. His hair was black too, but, unlike Mist’s, it spiked up a bit and had been cut messily. He carried a Clever’s Scythe with him and Nixion wondered why he still had one. Surely the Sanctuary would have taken it back when he had been fired. Nixion hated the cocky grin, that confident smile, that seemed permanently plastered to his face. It didn’t get better when he got the feeling that it wasn’t there because he was eternally happy, but more because he really was going to be the annoying, arrogant person Nixion had suspected of him earlier. Mist was leaning against a wall, the fire that hung in its holder behind him sending flickering lights to play on the back of his hair. He was making a plan with Thomas and Hunter and he seemed to be disagreeing with them over something. Dark was somewhere else in the Sanctuary, doing something that Nixion didn’t care about. Lyra, Kali and Mahogany were talking to Stavan, and he was licking up the attention. Mahogany seemed to like him well enough, but it was clear that Lyra didn’t think much of him and Kali was shifting around, biting her lip absent minded and looking down at the ground, holding one of her own arms by the elbow. Nixion himself was sitting in a dark corner, alone. He had no interest in making plans, or talking to Stavan. Or anyone else. Yet, he had an unsettling urge to talk to someone. Throughout all his life, even before the kidnapping, Nixion (Aiden back then) had preferred to be alone. He liked the silence, the solitude, the way he could think without interruption. So when he felt the urge to talk to people, like now, it confused him. Sometimes even worried him. He didn’t like it when he was confused. He liked it even less when he was worried. If he was worried then it usually meant his life was in danger. And though this situation didn’t involve imminent death, Stavan’s stupidity that Nixion was sure was there, could very easily lead him to his death, should he allow it. He made a mental note to himself never to trust Stavan or do anything he suggested, even if Mist agreed to it. …Why was he placing Mist’s opinion in a position of power? That in itself was unnatural. Something was wrong with Nixion today. Perhaps the Healer’s had done something to him. He made another mental note to slaughter them all should he ever be driven into insanity again. He looked up and Nixion became aware of Stavan standing over him. He allowed himself a second to scowl at himself for not noticing sooner and then redirected his scowl at Stavan who was grinning like a…a cat… Nixion had once read about it in a book. A…Cherry cat? He wasn’t sure…It wasn’t that Nixion couldn’t remember, it was that Nixion could barely read. Damn limited education. “Can I sit down?” Stavan asked, gesturing to the floor besides Nixion. Damn limited chairs, too, he continued in his head. Nixion thought for a moment of Stavan’s request. Stavan laughed as if he appreciated the joke and waited for Nixion to say something else. When he didn’t, Stavan’s brow furrowed for a moment before sitting himself down beside Nixion awkwardly. “Oh, for…” Nixion muttered and shifted away from Stavan. Because he was taller than Nixion, he had a harder time getting comfortable. He didn’t think the scythe strapped to his back helped. Nixion made a sound that may have been a conformation or a threat as he vomited on the inside. Stavan took it as the former and continued. Nixion noticed that somehow Stavan was talking about one of his fights. At first, Nixion was sceptical, and thought he was making a lot of it up. But as the details got more complicated and exciting, the more Nixion found himself listening to every word. “There’s no way you could get a vampires head to do that,” Nixion tried to stop grinning. Stavan seemed to give off a certain enthusiasm that was contagious. “Prove it.” Nixion almost laughed. “I have an idea where you could get one.” He replied. Stavan laughed. Against his better judgement, Nixion found himself liking the ex-Cleaver. “How’d you get fired anyway?” Nixion asked. Stavan’s grin seemed to disappear for a second. Then he smiled, but it wasn’t as enthusiastic as his grin was. “Why?” Nixion was curious. The way he said it, it seemed like the Sanctuary had blown something he did out of proportion. “What? Me? No, I would never do something so irresponsible.” Stavan said in a pompous manner. “So they fired you for dancing?” Nixion asked sceptically. He thought this was highly unfair. Nixion frowned, partially because it sounded so much like him. “Why would you become a cleaver if you weren’t serious and didn’t take orders?” he asked. “Sorry,” Nixion said, obviously not sorry at all. Mist shrugged, accepting the apology that held no meaning behind it far faster than he expected. Nixion frowned. Stavan was good according to both Mist and Stavan, and Kali was alright. But why send Hunter on that mission? They had never seen him fight. And why wouldn’t Mist want to go on this one personally? If it was one that was most likely to amount to something, surely he would want to see it himself. Nixion groaned. He might have had a limited education, but even he could work out who was left. “And finally, me, Nixion and Thomas will take the third, least likely lead.” Mist finished, clapping his hands together and grinning at Nixion maddeningly, silently tempting him to burst out in anger. Then Mist began talking about where the groups were going, and what sort of lead was it. Nixion was barley listening. They were going on the worst lead. This was going to be boring. And he was going with Mist. “So you all know where you’re going then?” he asked the group at large after four more minutes. “Excellent. Get going then.” They all turned away and swarmed for the exit corridor to the right leaving Thomas, Mist and Nixion alone. Thomas remained for a few seconds, then headed for the exit too. Mist made to follow him, but muttered something to Nixion as he passed. “It’s good to see you’ve made a friend.” He grinned. Nixion, Mist and Thomas were going to “visit” (Thomas had used that word in an attempt to cheer Nixion up when he had started muttering darkly which earned him a punch to the gut. Mist had not approved of this action but Thomas had said not to worry) an old factory that had been used by a few sorcerers who had needed a place to stay while on the run from the Sanctuary a few years back. Hidden and barely noticed, it was a good place to hide out. However, it was unlikely that any of the Remaining would be stupid enough to hide in it, especially since the Sanctuary had made a note to go and check on the place every two months. “Why’d you give us the worst place to go?” Nixion complained darkly as they walked towards the horribly unlikely lead. He only just managed to restrain himself from saying “And making us take one of the worse team members along too.”. Thomas was only thirteen, and his magic was a strange ability to have. Nixion failed to see how it would be useful in a fight. He had never seen Thomas fight, and despite reassurances that he was a good combatant from Mist, he still thought that Thomas was mostly, if not entirely, useless to the rest of the group. “Think of it as a test,” Mist said. “A test?” Nixion asked him incredulously. Nixion looked at him for a second, but when it became clear that he wasn’t going to say anymore, Nixion simply scowled at the ground as they continued walking, rocks and other useless things crunching under his boot from below. Within a few minutes, they were outside the door to the factory. It was made of what looked to be rusting metal. Mist nodded at Thomas, and he went off somewhere along the side. Before Nixion could ask how they had devised the form of sign language without his knowledge, Mist held his ear up to the door and listened intensely. Nixion scowled at the door as Mist listen to it. Thomas was doing his own thing, Mist was being the door whisperer, and Nixion was in the dark, completely confused about what was going on. Mist listened for another few seconds, then nodded to himself and looked at Nixion. “I can’t hear anything,” he said, looking slightly worried. “But that doesn’t mean it’s safe, so be alert.” Mist muttered quietly. “I’m ready.” Thomas’ voice came from behind Nixion, and he turned around. Thomas was wearing what appeared to be armour made of metal that he had torn of something. It wasn't pretty, but it looked threatening. It was made up of different pieces of the same reddish metal. The pieces were pushed tightly together, and it looked crumbled but stable. There were gaps for the eyes, and another for the mouth. At the hands, there were no fingers, just a mitten style four fingers together, and the thumb separate. Only Thomas’ power let him move in the armour, moving the metal as he walked, or raised his arm. He could be the young Ned Kelly. Nixion raised his eyebrows, seeing for the first time that Thomas’ power could be useful. Mist simply nodded and opened the factory door, revealing a long corridor. It creaked as it opened, so if anyone was here, they’d hear about it. And every step Thomas took clanged against the concrete floor. Stealth was out of the question, so they quickly ran through the corridor, hoping to catch anyone there before they could prepare themselves. As they slammed through the doors at the end of the corridor, they found them waiting. An army of Hollow Men were standing there, spread throughout the ground floor of the factory. On the second floor, there was a stage sort of thing, where people from the second floor could see onto the first. It wasn’t quite a balcony. More of a weird distortion of the ground. Like a chunk had been carelessly slabbed on. On that stage was a man. He was an average man, nothing stood out about him. If Nixion had seen him on the street, he would have ignored him. However, here, with the man grinning down at them, and an army of Hollow Men surrounding them, Nixion felt compelled to pay attention. The man was average in height and size. He had black hair, and brown eyes. He was wearing jeans and a T-shirt. Absolutely nothing stood out about him. Except for the fact that he was in the factory. The man, obviously named Keeve, unless Mist just decided to call one of the Hollow Men that, smiled. “You don’t know a lot of things,” he said, wiping hair that didn’t reach his eyes out of his eyes. Then he looked at Nixion. Nixion opened his mouth to say something threatening, but Mist interrupted him before he spoke. Nixion had no idea what he was on about, but Keeve smiled. “Work it out,” he said, and by some signal, all the Hollow Men moved towards them. Nixion drew his machete quickly, and in the same movement cut through a Hollow Men’s stomach sending horrid gasses leaking through the room. Mist sliced through a Hollow Men carelessly and leaped around the skin that crumpled to the ground and ran for the stairs. Thomas simply punched the papery army, making holes in their skin, causing them to deflate. Nixion cut through them, but the machete was too big, and the hallow men were crowding around him, making it hard to use the weapon properly. He was pushed from behind, sending him into Mist’s path. He staggered away for a second, ran into another Hollow Man and returned to Mist after slicing it open again. Nixion shook his head quickly, ducking under a Hollow Man fist and slicing it’s head off in succession. Mist said something - probably a warning - but Nixion was no longer listening. He ran forward a few steps and pushed off the ground, his right foot landing on a Hollow Men head. He used that as a platform, and managed to get his fingers on the edge of the stage. He pulled himself up, rolled and came up with his machete shining against the air menacingly. Keeve was just standing there, not disturbed in the slightest about the ex-serial killer standing in front of him. Can you be an ex-serial killer? It didn’t sound right to Nixion. What changes you from being a murder and an ex-murder? Do you have to have stopped for a certain amount of time…? He should know this type of stuff. “Thanks, but I’ll pass.” Nixion snarled, pulling himself away from the temptation of what could have been a potential cookie fest. Keeve’s fingers curled into his palm and clenched into a fist. “That was a one-time offer boy,” he warned. He waited a second before nodding. Nixion wondered why he was so interested. The Keeve opened his mouth and unleashed a sonic wave. The wave screeched and shook Nixion’s ears. His eyes screwed up and Nixion staggered back, his hands clutching at his ears as the machete clattered to the ground. This sonic wave was killing him. The pain ate at him and his brain shook violently, all form of thought cut off. Nixion attempted to back away from it. The sonic wave went all the way to the wall at the other end of the factory, but Nixion’s head was scrambled, and by instinct he backed away. Luck suddenly decided to help him and Nixion tripped over his own feet which sent him sideways, out of the path of the sonic wave, and crashing to the ground. Out of the corner of his eye, Nixion caught sight of Keeve turning to Mist and Thomas battling on the ground below and unleashed another sonic wave crashing down on them. Mist saw what was coming for him just in time and managed to leap out of the way. Thomas, in his heavy armour, didn’t. All the Hollow Men within the reach of the sonic wave swelled up and exploded sending the room into a never ending spiral of putrid smelling gas. Nixion thought that Thomas would be protected by his armour. But when the sonic wave hit him, he brought his arms up to his head, as if trying to protect it and Nixion could hear his screams. Nixion tried to stand, but felt dizzy. He could barely see, his vision was all blurry and his head pounded. Every part of him felt sore, as if he had just been fighting for several days straight. He felt drained. Mist used the air to get himself up to the stage. Keeve pulled away from the sonic wave, and turned to him. Thomas was still screaming, but they were getting quieter and Nixion saw he was on the ground now, barely conscious. Keeve let loose another sonic wave, and it knocked Mist backwards. Nixion wasn’t caught in it and used this to his advantage. Despite his disorientation and pain, Nixion staggered forwards and launched himself into Keeve, knocking him sideways and stopping the sonic wave. Mist hadn’t screamed in pain and was already on his feet again but one of his eyes was shut and his was clutching at his shoulder painfully. The sonic wave stopped, and through his blurred vision, Nixion could see Keeve running away, out a door at the back to of stage. Mist was up first, running after him. Nixion took a second to get his bearing and ran after Mist. Unlike Mist, he walked forward cautiously. He picked up his machete, which was still vibrating slightly, and walked towards to door. They would be way ahead of him by now, if they were still running. He had no hope of catching up. He was tired, and felt like he needed to sleep. His skin stung and his head was killing him. Nixion peeked around the door, and saw it split into two corridors. The left was in perfect order, everything straight and neat. The right had glass on the floor from exploded picture frames, pieces of a wooden table spread everywhere and dents in the metal walls. Nixion took a wild guess and went right. He tried to listen for the obvious sound of the sonic wave, but his ears were ringing and Nixion could barely hear anyway. His footsteps sounded muffled, as if he had cotton wool in his ears. At the end of the corridor, it had a left turn. Nixion took it and saw more damage littered across the once neat hallways. Nixion took a few more steps then heard something that he could only describe as a vibrating in the air. His machete vibrated a little faster, and he started running. He took a right turn and just saw Mist taking a left turn. Nixion quickly followed, and in a few seconds was running right behind Mist as they chased Keeve. Keeve looked over his shoulder and saw that they were gaining on him. He looks tired, Nixion thought. He realised that his magic took a lot out of him. Keeve quickly spun around and a sonic wave bigger than all the others hit Mist and Nixion. Nixion felt as if his head was splitting apart. His eyesight faded to hazy impressions, and a few seconds later, his hearing stopped. His bones felt like they were being pushed apart from the inside, and his muscles felt like they were dying. And that was nothing compared to Mist. Mist had been just a few steps behind Keeve when he was hit, and it affected him worse than it did to Nixion. And yet he still saw Mist staggering around as the sonic wave dissipated. For three seconds Nixion was amazed at Mist still on his feet. But then he collapsed onto his knees and lost consciousness as the rest of his body came crashing onto the ground. Nixion was at least two meters behind Mist, but he didn’t think he could stand another second of it. He fell down onto his back, his body numb, and was about to fall into blissful unconsciousness when the pain really kicked in. Instead of forcing Nixion into a black out, it woke him up instead. Head still pounding, body still screaming at him, Nixion blinked for a second, confused. Then he saw that Keeve thought he had fallen. Nixion sat up and looked at where Keeve had been standing. He was gone, thinking he had won. The numbness then stopped, and Nixion rolled onto his side and threw up. His head felt like it was made of jelly. He wasn’t even on his feet, yet he was swaying. Nixion got to his feet and took an unsteady step. The world was spinning, but Nixion could barely see any of it anyway. He blinked a few times to get his vision clearer, and looked down at Mist. Through his blurred eyes, he couldn’t see if he was alright, but after a few seconds, Mist began to stir. Nixion saw this as a good sign, and went after Keeve. He couldn’t let someone attack him like that and get away with it. If he was a person who thought about things before doing them, he might have realised that it was unlikely that he would beat anyone in his condition. But Nixion wasn’t a thinker. He was a man of action, and his action right now was staggering after Keeve. And occasionally falling over too. After a few steps he began to get into a rhythm. After a while, he was practically running. He guessed which corners to turn, and hoped he was right. It was all he could do to prevent himself from spewing every two seconds, he couldn’t stop to think which corner to turn around. In a couple of minutes, he rounded a seventh corner and saw Keeve walking calmly. Nixion’s anger overtook him, and ignoring the pain, he charged towards Keeve. The man frowned and turned, just in time to see the handle of a machete slam into his face. 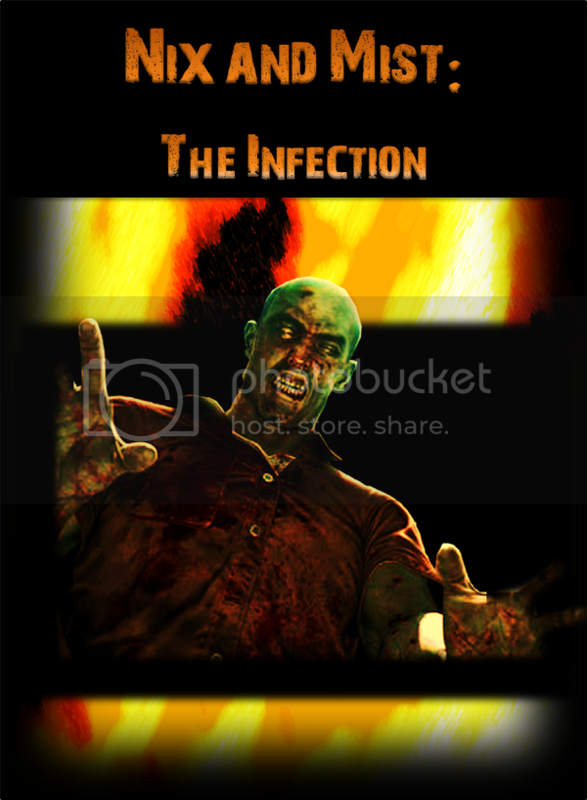 Keeve stumbled backwards, trying to concentrate despite the steady flow of blood now streaming down from his nose. Nixion dropped his machete and tapped his fingertips against Keeve’s collarbone. Keeve opened his mouth and screamed without making a sound. Nixion swept his legs from under him and frowned. Something wasn’t right. Keeve was on the ground moaning silently. That was it. Keeve was making noise, Nixion just couldn’t hear it. Where were the screams, the sound of bones snapping? Nixion knelt down, and gripping Keeve’s hair, slammed his head against the ground. No, not even knocking sound. Nixion stood and kicked Keeve in the ribs. He was unconscious now, but it made Nixion feel better. He touched his ear and realised his ears were bleeding. He hoped the Sanctuary Healers got here in time to fix them. He dragged Keeve into a room, got a pair of shackles and cuffed Keeve, putting the chains behind the bed post. Then he punched him in the jaw for good measure. Nixion turned away from Keeve and began walking back to where he had left Mist. By the time he got there, having taken a few wrong turns, Mist was standing up and had already called the Sanctuary. It soon became apparent that he couldn’t hear any more than Nixion could so the two just nodded to each other and made their way back to Thomas. He didn’t know how the Sanctuary officials were going to find Keeve, but chances were they would strip the place down looking for him anyway so it didn’t really matter. Instead, Mist started making movements to go and check on Thomas. Nixion nodded and ran ahead of Mist back towards Thomas. He had completely forgotten about him. When he got to the stage, he looked down and saw that Thomas was lying there. Weak, Nixion thought. Both he and Mist were up by now, but Thomas was still lying there, unconscious. He walked down the stairs and stood over Thomas. “Get up,” he said sceptically. Although he couldn’t hear himself, he was sure it was audible, even with armour on. Then he realised that Thomas might be deaf too. He knelt down and shook him. Something wasn’t right with the armour. He touched a piece at the arm, and then peeled it off. It was more like tinfoil then the original metal. The he saw Thomas’ skin. It was like someone had taken a hammer to it. His arm was bruised and yellow. Every so often, a small rupture was there, like the hammer had managed to get through to the flesh in some places. Nixion touched his arm. It was cold. Nixion looked up at Mist as horror surged through him. Nixion out Thomas on his back and ripped of the face armour. He was definitely dead. His blank eyes looked up at the ceiling. Thomas’ face was the same as his arm; bruised and ruptured. Blood was pooling from his ears. Nixion realised that when he heard Thomas’ scream getting quieter, it hadn’t been him getting over the pain. It had been him dying. Nixion scowled. This boy was only thirteen. He had a family. He had a life outside fighting. He didn’t deserve to die. Nixion stood and looked at the stage. Mist was standing there dragging an unconscious Keeve behind him. Nixion didn’t care how he had managed to find the criminal so quickly. Despite what Nixion had thought about Thomas before, he realized he really didn’t want him gone. Nixion looked at Mist and shook his head. Mist closed his eyes for a second. Then he looked up and threw Keeve over the side of the stage. He followed, using the air to cushion his fall. Keeve hit the ground hard, and Mist, after landing, kicked his head hard as he walked to Nixion. Suddenly, Mist looked over his shoulder, and Nixion spun around, thinking it was more Hollow Men. In actual fact, it was the Cleavers, running through the door, followed by other Sanctuary agents and Healers. Nixion looked at Keeve as he was dragged away by Cleavers. He was going to pay for this. Aw. Poor Thomas. I'm glad now that you didn't have his brain melted. Hehe. You know, I think this is the only story I haven't put myself in. Like, the stories that you put yourself in...you know. Wow... It's really good. You made it real for me when I found out Thomas died. It really felt... real. You guys are getting better and better! Nice job! I do know. I do it with everything. It's hard to do it with this one, isn't it? *frowns* Not really. You just asked me for a character profile. That was really good . . . Best chapter yet. I like how he died. It added good emotions in it. I don't really know the words, but whatever, the dying was a good thing. The chapter was going to be called "Chained to a Bedpost" but SOMEONE wanted it to make sense. Sound travels 15 times faster through steel than air. And I should also say that 2 mistakes is quite a good stat. 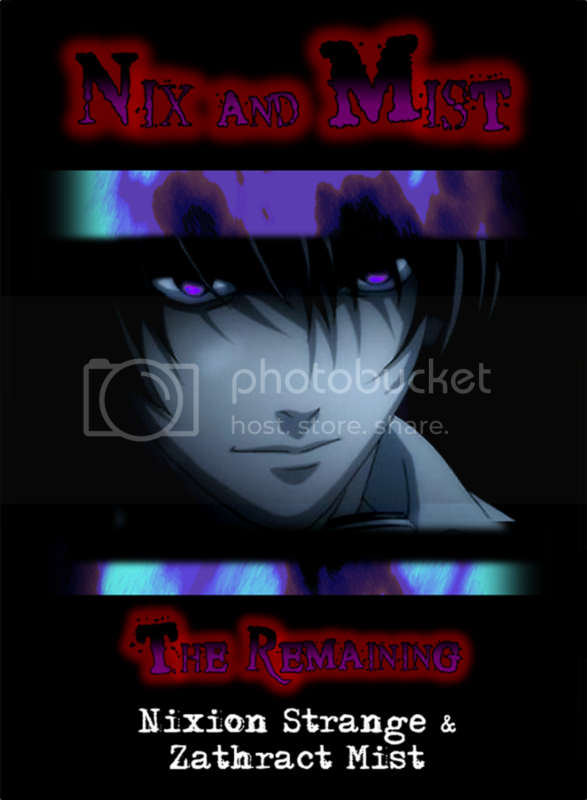 Follow the Nix and Mist Story by Email like lazy people! Copywrite of Nixion Strange and Zathract Mist, authors [and/or] editors: Darkness Inc - 2012. Awesome Inc. theme. Powered by Blogger.